This is the story of Taeko who is fast approaching 30 years of age and still single (much to her mother's disappointment). She takes a trip to the countryside to visit her brother-in-law's family. During the journey and subsequent stay she reminisces about her childhood and we see key points in her life that have lead her to her current life as an office worker. Wow, the animation is really detailed especially with the flower-picking. It has a real-life story feel that is uncomplicated with magic or other fantasy qualities. It has a solid story that makes sense. 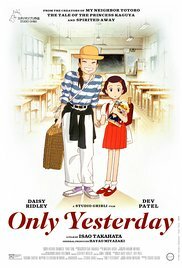 Unlike other Ghibli films the characters in this film are much older that teenagers. One character smokes in the film. Taeko is hit across the face in a memory. It mentions...menstruation cycles. Firstly, I chose this film to review because it is about to air in Australian cinemas for the first time with the English-dub (sadly I don't live on the East Coast and have access to view the English version so this review purely looks at the Japanese version - I'll update when I get hold of the English dub). I love this film...but then again I watched this movie for the first time when I was Taeko's age and perhaps my liking is because I could relate to her in a lot of ways. This is not a film I would play in a primary school classroom. The story and themes are likely to sail completely over their young heads and I personally don't think it would be appropriate. High school? Sure. This film mentions a taboo subject...menstruation. Let's face it, besides crude and non-funny jokes usually made in big-budget "comedy" films where the lines are usually made by a man, we don't actually hear of menstruation cycles, periods etc. in films. I suspect the mention of Aunty Flow is actually what prevented the English dub from being made in the last couple of decades...but better late than never! It is only a brief mention. If using this film in your classroom then I suggest a bit of background on Japanese history and culture is completely necessary. You can't just watch the film and expect the student to understand it. This is mainly because of the setting. Taeko is an adult in the late 80s/early 90s - this is the dinosaur age for the current generation - they won't get it. Added to this are the flashbacks which of course take you back another 20 years...now we are in the Dark Ages for this generation. A bit of background on the decades first will go a long way in helping your students to make connections. Do a bit of research about safflowers. When Taeko is picking them on the farm she does give a quick little history lesson on the uses of them and this could be a great opening for science experiments (if you can get hold of some) or art lessons (bring on the tie-dying!). Japanese customs - again either you or the students should do some research and look at why Taeko's father was so angry that we left the house without her shoes on...and look at other customs that have changed as well. Make sure you have information handy to explain the ending. Most, if not all, of the students will not understand the significance of the "wooden thing" the kids are holding behind Taeko and Toshio - it is called a Ai Ai Gasa (think of it as a Japanese Valentine heart). Then and Now. History and comparison is a hot focus at the moment in Australia - so use it. Have the students create Venn Diagrams to compare their life with Taeko's. Coming as soon as I have gotten hold of the English dub. * This movie is higher than the standard G rating allowed to be shown in most schools. * You will most likely be required to get parental permission for your class to view this movie.